How to Explore the Swiss Alps! All photos were taken by my amazingly talented sister, Abby Miller. The Swiss Alps, specifically the Jungfrau region of Berner Oberland, is stunning. If you are going to Switzerland you MUST add the Alps to your schedule. We were in awe every moment of the trip. One of the lessons I've learned over years of travel is quality over quantity. After doing some research and reading the wise words of Rick Steves, I decided we were going to focus our time in Switzerland on arguably the best and most famous part of the country, the ALPS! I'm going to break my Switzerland posts up into three sections and try to cover everything I learned. This first post is a general overview of Berner Oberland and logistics. Berner Oberland is the region south of the Swiss capital of Bern. The Jungfrau region begins in Interlaken. It's easily accessible thanks to Switzerland's great railway system. This map provides a great visual of the area. And guess what? It was the perfect time of year. The weather was glorious. The most blue, clear skies and temperatures in the high 60s/low 70s. The crowds were visibly lower as well. I could tell day-by-day more people were arriving. The one downside to going in late May is that several of the hiking trails are closed. In hindsight, I wouldn't have attempted them anyway but you should be aware of that. Some restaurants and hotels had not opened yet either. The prime summer season for visiting the Alps is mid-June through August. My advice: Check this website to see when the cable cars are expected to open and close for the summer season and book a trip around those dates. I generally advocate for traveling in the shoulder season and would say the same here -- early June or mid-September would be my recommendation to get enjoy everything the region has to offer with good weather and limited crowds. We were there for three nights and 2.5 days which turned out to be a good amount of time. Two full days allowed us enough time to see both sides of the valley and visit several of the villages. On the flip side, you could easily stay for a week. There are some bigger excursions which we did not do. You can also do a quite a bit of hiking which we did not do. I have way too many places on my bucket list to spend more time or money than 3 nights in one spot. Should I get the Swiss Travel Pass? YES. In the Alps you will be using a combination of trains and cable cars to get around. The Swiss Travel Pass made it incredibly easy to have a flexible schedule and jump on transportation whenever. The pass allows you to take on unlimited number of trains, cable cars, buses each day. The pass starts at 3 days for $225 per person. It was definitely worth it. To be noted -- the pass only covers 50% of the fee for the some of the highest cable cars. In that case when you have the pass, you just pay the difference. Another option in the Jungfrau Travel Pass. This pass ONLY covers the Jungrau/Berner Oberland region. If you are visiting the Alps, you are likely coming from another destination in Switzerland and my guess is the Swiss Travel Pass would be a better deal. We stayed in Wengen. This was another decision I really debated over and was unsure about prior to our travel. 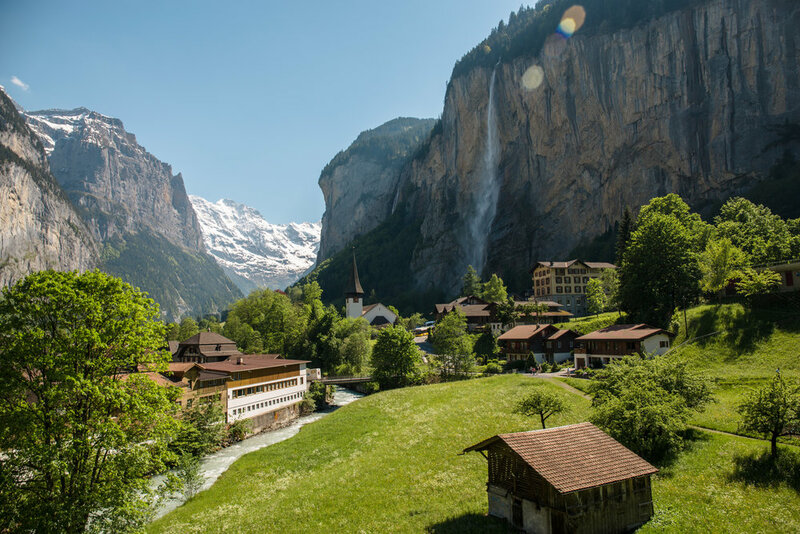 Many people choose to stay in the base town, Lauterbrunnen, which is accessible by car. My opinion is that you would really miss out on the Alps experience if you don't say in one of the villages higher up in the mountains (and aren't accessible by car). All of the villages are pretty small (population ~ 1,000) but some cater more to tourists than others by having hotels and restaurants. Wengen was great because it was centrally located. In the map above you can see Wengen is in the middle of both valleys which made it easy to get to both sides. Wengen is large enough that there were several (10ish) restaurants for dinners, a small grocery store, and multiple lodging options. Two other popular towns to stay overnight in are Murren and Grindelwald. Murren is similar to Wengen in size and availability of options but not as central to everything else. Grindelwald is definitely larger than Wengen and Murren but to me felt a little less authentic and more touristy. We stayed at the Hotel Belvedere. It's a three-star hotel and cost $200/night. The best part about the hotel was the views from our room and the breakfast which was included in the rate. I definitely recommend Wengen as a base. The beautiful town of Wengen! DO I NEED TO BE IN SHAPE/ CAN I TAKE KIDS? This might be the most most surprising thing I learned -- the Swiss Alps are doable for any age. We saw tons of families and people of all ages. There are playgrounds EVERYWHERE for kids. The main thing to do in the Alps is to simply see the region. This can be be done through hiking, trains, cable cars, walking through villages, paragliding, etc. I thought we would do a lot more hiking/walking than we did. I quickly learned that even "moderate" hikes felt quite strenuous with the altitude. The good news is that trains and cable cars go to nearly all the villages and mountain tops. You can make your trip to the Alps as leisurely or physically strenuous and still see the same things! More coming up soon in the Switzerland Guide!